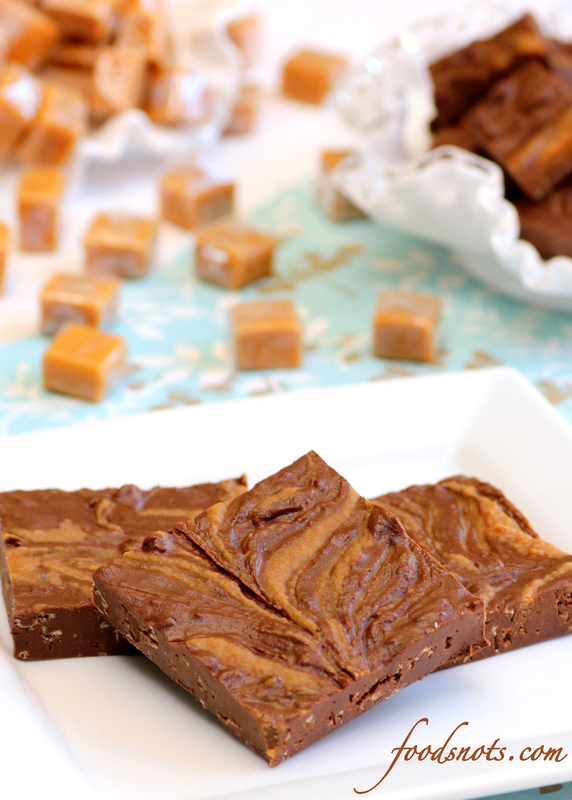 Unbelievable – more than 100.000 shares on pinterest for this recipe. I can’t believe my recipe has become so popular. I don’t know if any of you are as addicted to Food Network as much as I am, but I watch it all the time. One night me and my hubby were watching Unwrapped and I saw this chocolate candy called C2P2. I absolutely had to try, but of course, the place that sells it is located all the way in New York. Ugh!! So here is my cheep imitation to get this craving out of my system. The C2P2 stands for the ingredients involved in making it. 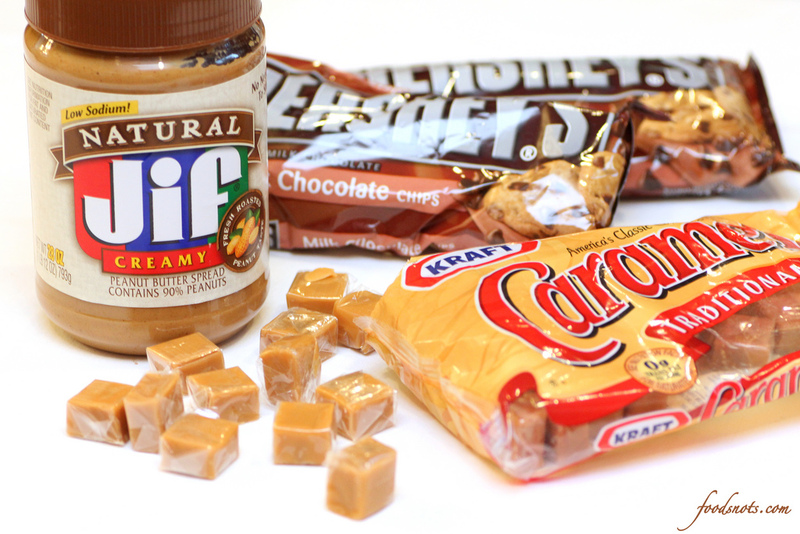 Chocolate, Caramel (C2), Peanut Butter, and Potato Chips (P2). Yum, right!? Or if anything, I thought it was at least going to be interesting. But no, totally delicious. Although, this is the first time I’ve made it, so let me throw in one modification that you wont actually see demonstrated in my pictures. This really needs some more caramel. I thought I added enough, but no. The peanut butter still totally overpowered it. So at the end in the recipe I’m including 1/2 a jar to a whole jar of caramel ice cream topping, on top of the caramel in with the peanut butter. It’s going to make the chocolate squares a little gooey on top, but in my opinion, the messy stuff is always better ;). Enjoy!! Line a 17.25 x 11.5 x 1-in. cookie sheet with either tin foil or parchment paper. Set aside. Place whole potato chips in a zip lock bag. Using a rolling pin, roll over chips until chips are in small pieces. Set aside. 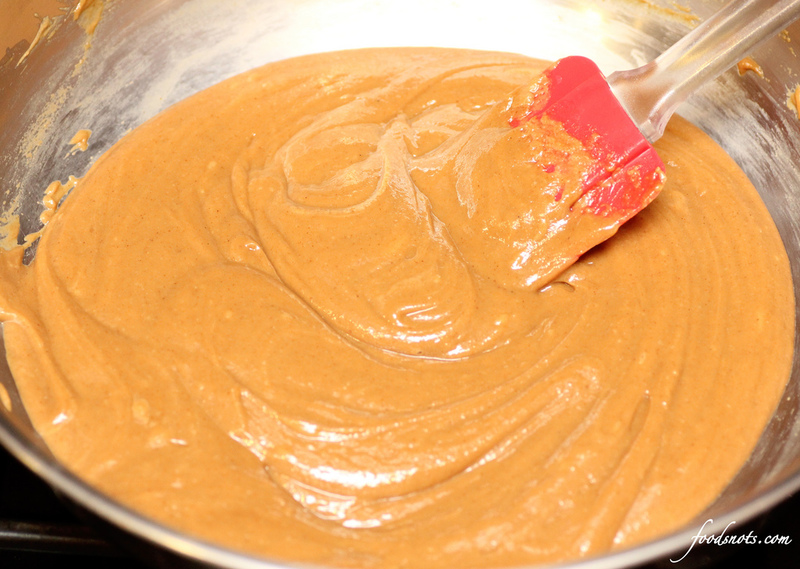 In a medium sauce pan over medium-low heat add peanut butter and water until melted and combined. 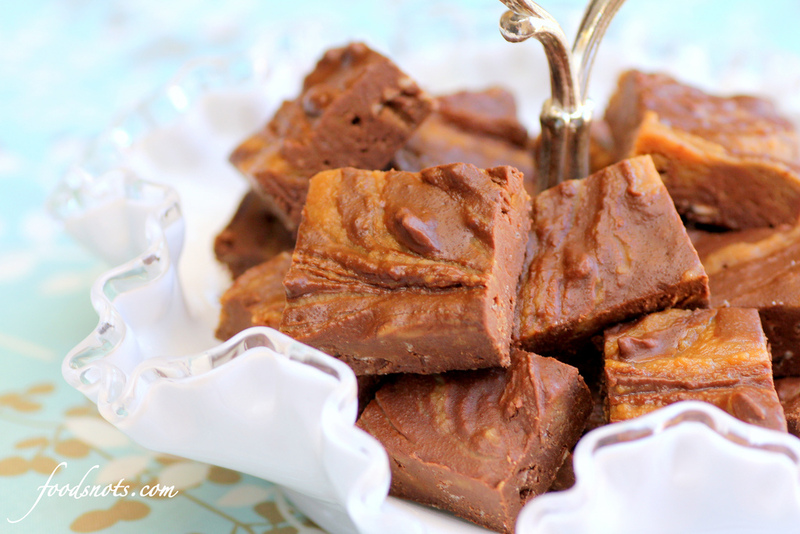 Add caramel squares and heat until smooth, stirring frequently. Turn off heat and stir in warm cream until well incorporated. Set aside. In a large heat proof bowl add chocolate and melt over boiling water (the pot rim needs to be smaller then your bowl slightly so the pot will keep the bowl suspended above the boiling water). Continuously stir until chocolate has reached between 115 degrees to 118 degrees F. Once chocolate reaches proper temperature immediately remove from heat. Fold in crushed potato chips until well incorporated. Pour onto prepared cookie sheet. 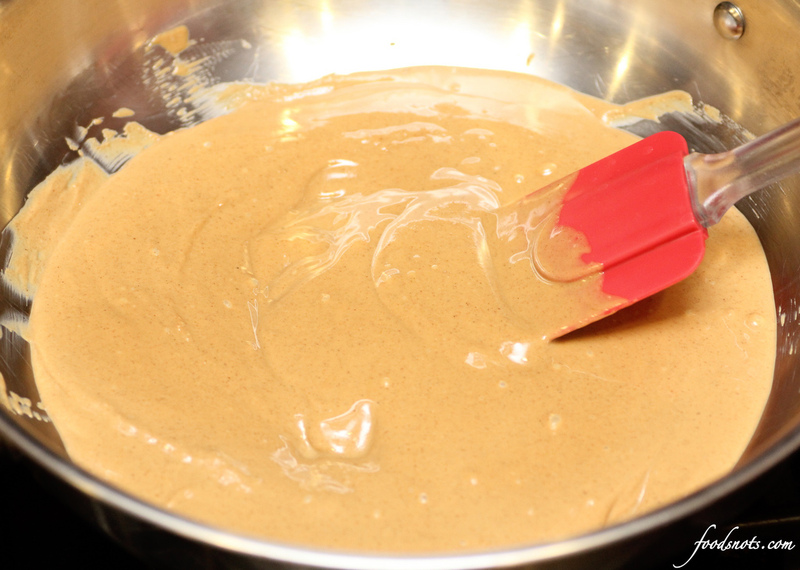 Smooth out evenly over cookie sheet and add large dollops of peanut butter mix. 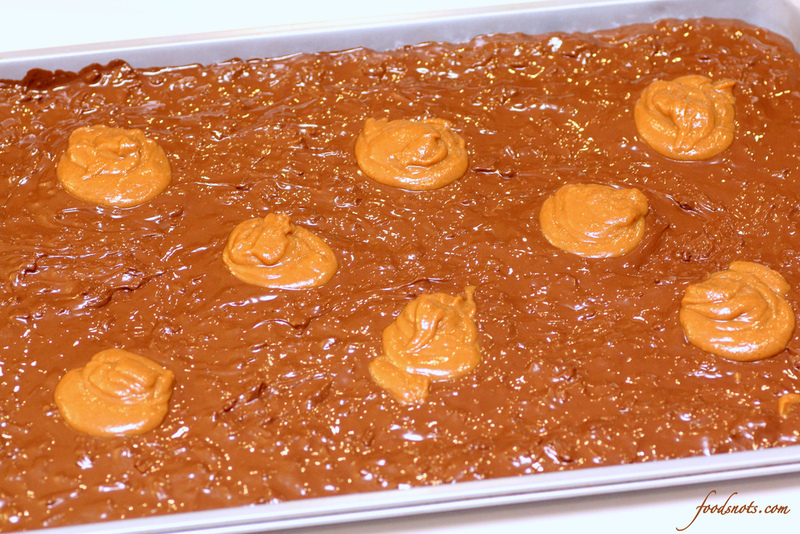 Drizzle 1/2 to whole jar of caramel ice cream topper over chocolate and peanut butter. Using a butter knife, pass over chocolate several times over the length of the pan (going up and then down). Repeat, passing the knife over the width of the pan (going back and forth). 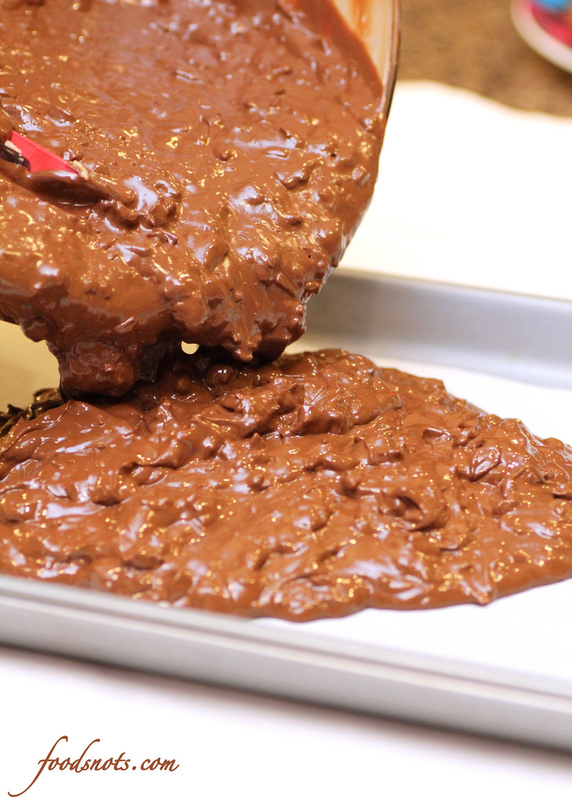 After somewhat incorporating toppings over the chocolate, pick up the pan and firmly tap the bottom of the pan against the counter a couple times (don’t just let go when dropping pan, or else you’ll have a mess). 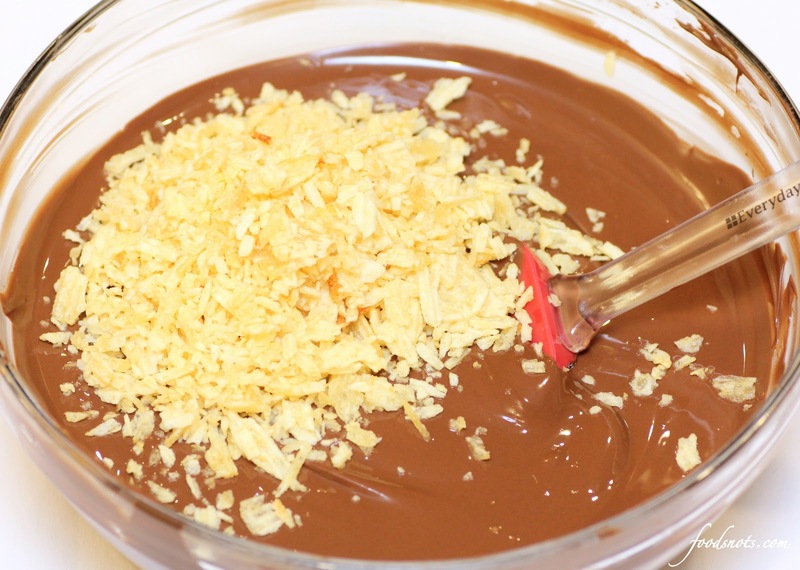 This will help to smooth out any rough areas in the chocolate. Place in the refrigerator for about 30 minutes to let set. Cut into squares and serve. Yield: 100-160 individual squares. Food “snots.” Not snobs? Please tell me there’s a story. And the treat looks fantastic!